The bear was adopted as a heraldic symbol of the City of Berlin in 1709 and has evolved over the years into something of a city mascot. 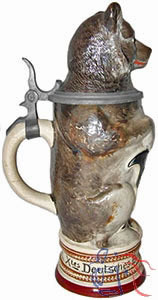 Production of this stein was relatively short-lived, being replaced at model No. 731 after 1890 with a relief decorated vase.